Malaysia needs to keep its household debt in check to keep the economy on an even keel, says Prof Dr Michael Heise, chief economist at Allianz SE. Malaysia’s economy currently faces domestic risks such as a high level of public and household debt and external risks such as the rising trade tensions between the US and China. 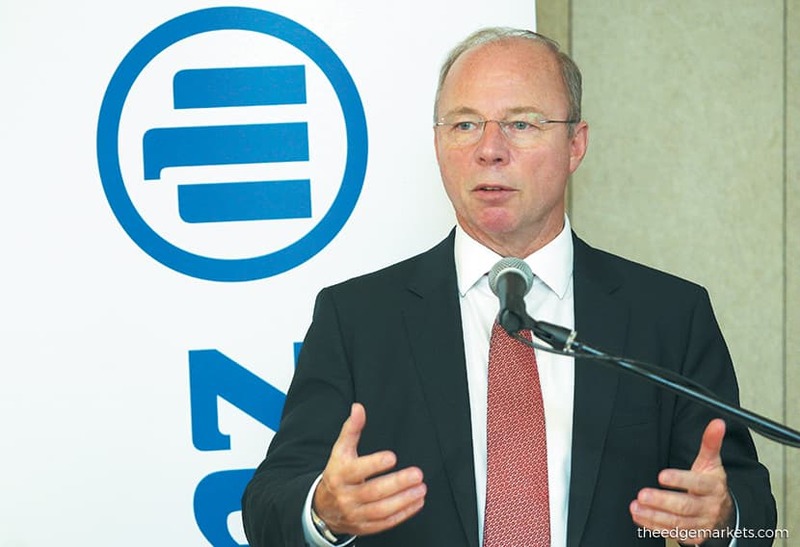 Citing the Allianz Global Wealth Report 2018, which was published last month, Heise says Malaysia’s economy had a strong showing last year despite the very challenging environment. The report is based on data compiled from 53 countries, which account for 91% of the global GDP and 68% of the world’s population. “The forecast for many countries [in Asia] — including Malaysia, which is slowing down from a brisk pace of 5.8% [GDP growth] in 2017 to about 4.7% this year, and maybe 4.6% or 4.7% next year — is still very impressive,” says Heise. Malaysia’s household debt remained elevated last year at 84.4% of GDP, way above the average of Asia ex-Japan (49.2%). Nevertheless, Malaysians have shown some restraint in borrowing over the last few years, with the debt-to-GDP ratio falling from a record high of 89% in 2015, according to the report. “The debt-to-economic output ratio is already alarmingly high in some countries in the region. Two of them — Malaysia (84.4%) and Thailand (79.1%) — have already significantly exceeded the 50% mark,” says the report, which was written by Heise, Kathrin Brandmeir, Dr Michaela Grimm and Dr Arne Holzhausen. “The figures for both countries were also more than twice as high as the average for emerging markets as a whole (37.2%). Thus, they are gradually coming closer to the debt ratio that households in Spain (86.6%), the US (100.3%) and Ireland (100.7%) had reached at the end of 2007, shortly before the credit bubble burst. He points out that there are three challenges for Asian economies in these difficult times — the elevated household debt levels, the current protectionism measures and the US Federal Reserve’s normalisation of interest rates. But he is not too concerned about the Fed’s rate hike as he does not see the central bank taking a hawkish stance. Malaysia’s public debt level (54% of GDP last year) is another issue for the government as it is higher than those of other emerging markets such as Thailand (42%), the Philippines (38%) and Indonesia (29%). Yet, Malaysia’s public debt-to-GDP ratio is not as high as those of developed markets such as the US, where it is at least twice as much. “These numbers deserve some attention by policymakers to stabilise debt because rising interest rates can hit the economy more strongly if you have such a high debt situation than if your debt is more muted or at a lower level. What the Fed does — [and how] the central banks and international markets react to that — is very important for Malaysia, given the level of debt and the difficulty of the people to service it,” says Heise. Nevertheless, it is not certain that there will be a rate hike as it depends on what the upcoming national budget looks like, he adds. Heise expects some consolidation next year. And if the budget is tight, it will not be necessary to increase interest rates. “I think Malaysia has benefited from the recent risk-off mode of international markets, [due to] its reputation for stable and credible policies. This pays off when you have turbulence in the financial markets. So, I think it is right to go for some consolidation to tell the market that you are not letting the debt situation get out of hand,” he says. Heise says Malaysia’s gross financial assets per capita last year was above average compared with those of emerging Asia (including Japan) as a whole. He lauds the proportion of these financial assets — which are divided into bank deposits, securities, life insurance and pensions — as it reflects the development stage of the financial system. “The amount of bank deposits is rather low at 35% compared with other countries. [This means] the Malaysian saver is letting his money work in the securities as well as pension and life insurance markets. Usually, in less developed countries, people put most of their money in savings or bank accounts, which provide very low returns,” says Heise. Also, Malaysia’s prospective demographic development is much less of a concern than it is elsewhere, he adds. He points out that the country’s old-age dependency ratio (those 65 and above versus the working-age group of 15 to 64) of 9% is very positive. “That means there are 10 people to take care of one person who is 65 or older, and that is a really good ratio. It will go up, but it will not be as dramatic as in countries such as Singapore (19%), South Korea (20%) and Taiwan (19%),” says Heise. Malaysia’s insurance market saw moderate growth last year, he says. In terms of gross written premiums in relation to GDP, it is still rather moderate at 4%. So, there is room to increase insurance penetration and growth, he adds. “We see strong growth of the Malaysian insurance market going forward, given the state of the economy. We expect the market to increase over time, with a growth rate of about 6% in terms of premiums over the next 10 years. The growth will come less from property and casualty insurance and more from life insurance. This is based on our view of the GDP forecast,” says Heise. Meanwhile, at a press conference, Allianz Malaysia Bhd CEO Sean Wang says that despite the country’s changing tax mechanism — from the Goods and Services Tax to a three-month tax holiday to the reintroduction of the Sales and Services Tax (SST) — the rakyat’s purchasing power in the area of insurance is not significantly affected. “As far as the premium is concerned, we have the input tax credit to strike a balance with SST. In terms of the end-product, [the effects] on pricing will not be that significant because it is not a consumption tax with multiple tiers,” he adds. On the proposal to implement a social health insurance scheme for the B40 segment, Wang says he welcomes the idea of affordable health insurance for the general public as it would be a catalyst for the country to move towards a national healthcare scheme. “The government’s intention is to provide a safety net, basic coverage for the general population. It should be a collective initiative by the insurance industry and the government, but there are a lot of topics [to mull over], not only about policies but also infrastructure,” he adds. Wang says public hospitals as well as primary and secondary care providers must also be improved.